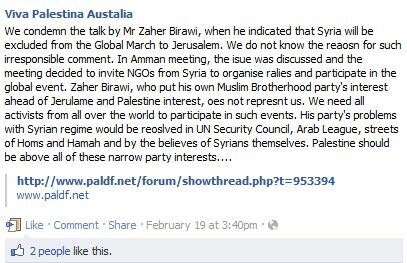 ‘Global March to Jerusalem’ Update: Quarrels within anti-Zionist ‘Sunni-Shia/Red-Green’ Alliance? Since the publication of the two-part report on the Global March on Jerusalem scheduled for March 30th, further information and several new developments have come to light thanks to the work of some wonderful people. 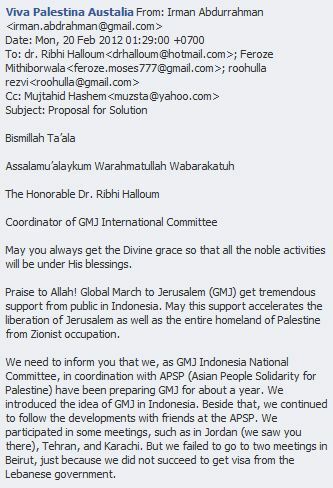 Aaron took a look at the subject of the registration and hosting of the various GMJ websites and found that they share an IP address with the website of the AhlulBayt Islamic Mission – the Islamic Republic of Iran aligned Shia missionary organisation in the United Kingdom. The server hosting both the AhlulBayt site and the GMJ sites is registered to a Leicester resident named Shabbir Hassanally. Read all the details here. Mr Hassanally appears to be quite a fan of Hizbollah’s Hassan Nasrallah. In fact he puts considerable effort into making English language sub-titles for Nasrallah’s frequent speeches which he then posts on his own blog – apparently unconcerned by the fact that Hizbollah’s military wing is proscribed by his own government and that the glorification of terrorism is a criminal offence in the UK. 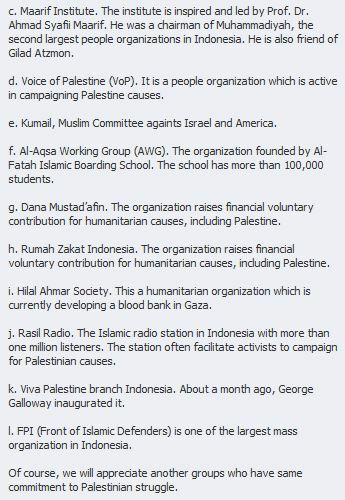 Hassanally has also acted as roving reporter in Lebanon for the Palestine Telegraph – founded and edited by Sameh Habib (aka Sameh Akram Subhi Habeeb) who is also spokesman for the flotilla-organising ‘European Campaign to End the Siege on Gaza’ which was set up by the Muslim Brotherhood’s European arm – the Federation of Islamic Organisations in Europe (FIOE) – in 2007. The Palestine Telegraph proved to be too extreme even for its former patron Jenny Tonge and it and its editor have been involved in multiple scandals. Here is Shabbir Hassanally celebrating the 32nd anniversary of the Iranian regime last year. Note his apparent subscription to the messianic Mahdi concept and his description of Israel as “the cancer occupying our beloved Palestine“. If UK readers are now pondering the efficacy of their government’s ‘Prevent‘ counter-terrorism policy upon which so much of their taxes have been spent, they will certainly not be reassured by the fact that Hassanally has also been given a platform at the Muslim Shia Welfare Foundation in Leicester, which is – of course – a registered charity. A variety of interested parties are making intense efforts to bring Jerusalem to the top of the publicity agenda ahead of the planned march next month, including a conference in Qatar earlier this week (for some reason apparently attended by UN representative Robert Serry), an incendiary press release by the Muslim Brotherhood’s spiritual mentor Yusuf al Qaradawi and publicity on the websites of Hamas and ‘Unified Umma’. 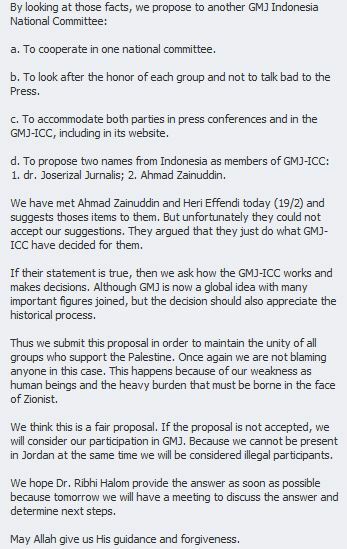 However, it would appear that all is not rosy in the world of joint Sunni-Shia/Red-Green alliance project management. 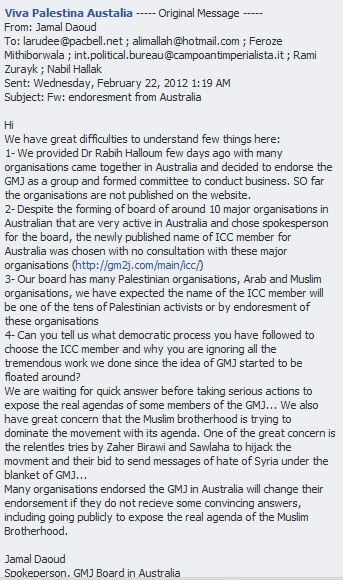 From the Facebook account of ‘Viva Palestina Australia‘ (h/t to F.) we learn that initial enthusiasm for the GMJ project has been somewhat dampened due to apparent differences of opinion with co-ordinator Zaher al Birawi. Meanwhile, over at ISM California, Paul Larudee is chastising his fellow activists for not getting behind the GMJ in sufficient numbers. 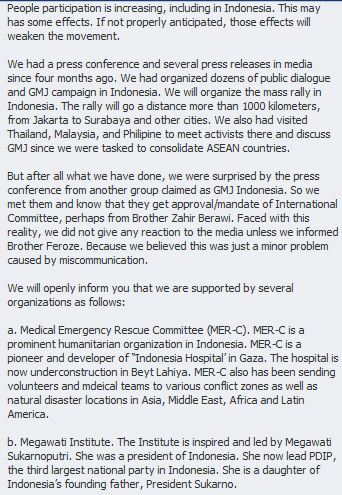 Well well; it seems as though some people even within the ‘pro-Palestinian’ movements are waking up to the extremist nature of the GMJ venture and its leaders and organisers and the fact that such publicity stunts do nothing to help the Palestinian people. Of course, he does not really consider the HM Government as his government. He no doubt considers himself a jihadi foot-soldier camping in enemy territory in Leicester. I would imagine he is very likely subsidized by the enemy’s generous welfare benefits, and laughing all the way to the mosque. Spreading rumors that the Jews want to destroy the mosque the Arab leaders started preparing the atmosphere in Jerusalem. The intention of hordes of people to enter the sovereign territory of Israel is something that needs to be brought to the attention of responsible people throughout the world. Those who encourage this sort of mad enterprise should remember the Crusades that they so revile. This bunch of misfits will be killing each other even before the start of this march,that is if it even gets off the ground. It is a stunt,and stunts can misfire or backfire,ask the Turks. 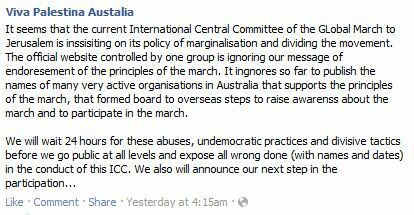 RE: Those who encourage this sort of mad enterprise should remember the Crusades that they so revile. You’re on the right track, but the crusade that best parallels this irresponsible and negligent adventure is the children’s crusade, where a mad monk led thousands of children to their deaths. I hope this is called off before the same happens here.